59-61 Royston Road, Garngad, Glasgow. G21 2QW. Tel: 01415521598. 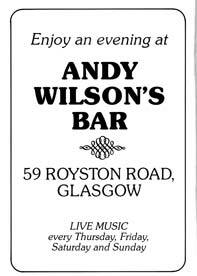 Wilson's on Royston Road is probably better known as the Big Glen. The same owners also owned the Glen Bar (Wee Glen) on Forge Street, Germiston. There has been licensed premises on this site since 1841, Hugh Buchanan the landlord occupied the old pub until the 1850s. The address was then Garngad Road. In 1861 till 1875 William Syme was the licensee here, he lived at number 59 next door to the public house, when he died his son Robert took over the business. Robert lost his wife at an early age and had to bring the children up on his own and run this busy tavern at the same time. Robert stayed out at John Knox Street by this time. The old premises were demolished and a new tenement with a public house on the ground floor was erected on the site of the old pub. Robert sold the pub to George McCallum in 1888. Mr McCallum was born in Ayrshire in 1852, at an early age he learned the ship carpenter's trade. For ten years he spent most of his time at sea traveling the world, visiting Indian, China and South America. At the age of 20 he was foreman, a great job for such a young man. On his return from India George was appointed Inspector by his boss at 44 West Street, South Side. He even turned his hand to engineering. Mr McCallum was appointed superintendent of the Strathleven, captained by Mr Pearson, a ship built by Blackwood & Gordon of Port Glasgow, which was the first ship to carry fresh meat from Australia to Glasgow. His next venture was to sail the Calcutta a ship that sailed the English Channel. George McCallum's brother John was the first to introduce the family department system to Glasgow pubs. The name of the pub in 1888 was the "Artisan," Tennant's enormous chemical works was a stones throw away from the pub, Blochairn and Glasgow steel works were up the brae while other smaller works were spread around the establishment, this meant that the pub was very busy with black faced men with soot covered cloths. George was also an inventor, it was he, in conjunction with Mr Harris, who made the beer raising machine, there headquarters were in West Street, south side and dispatched beer raising machines to pubs in Glasgow, Edinburgh, Dublin, Bristol and Perth. The Clanneries, Bungalow and Bodega, at the International Exhibition were fitted with there machines. The Bodega, Edinburgh used the machine for 32 taps of spirits, wines and beers. The McCallum & Harris Patent Automatic Liquor Raising Engine was one of the best in it's time. McCallum also owned the Caley Bar at the corner of Castle Street and Charles Street, and the Eunson's Cafe Royal, Argyle Street. In 1889 the pub was sold to James Myles, he also ran a pub on Dobbies Loan, James continued to serve the public here until 1913 just before the great war. Philip Flynn then took over, his wife Martha ran the pub after his death, the family ran the pub until 1950. John Dougan then took over the licence, Mr Dougan also had Dougan's Bar on the Gallowgate, his father John had Dougan's Bar, Springburn Road. Neil Dougan a brother ran the Windsor Tavern, Dumbarton Road. Left to right Harry Dougan, John Dougan sen, Neil Dougan, Mrs Dougan, Mr R King, managing director of John Begg Ltd, and John Dougan jun. at the opening of the refurbishment of the Glen bar. 1959. The Scottish Wine & Spirit Merchants Benevolent Institution outing at the annual cruise on the Firth of Clyde. Left to right John Dougan with his sun glasses, Douglas Arms, Gallowgate, Mr Neil Dougan, Windsor Tavern, Dumbarton Road, Mrs Harry Dougan, Mrs J Dougan and Mr Harry Dougan, Glen Bar, Royston Road. 1973. In the late 1950s the Glen Bar on Royston Road was closed for 101 days for a refurbishment, adjoining premises had been taken over to provide a new lounge bar, which was a credit to the Cowlairs district of the city. Various difficulties had to be overcome in the reconstruction of the pub, to celebrate the opening ceremony Mr & Mrs John Dougan sen and their three sons John, Neil and Harry were hosts to a gathering of friends and trade personalities. Left to right John Dougan jun, Mr J A MacDonald, Scottish Brewers, Mrs J Dougan sen, Neil Dougan and Harry Dougan. 1964. Friends and guests at the opening of the new Glen Bar. 1964. A feature of the new lounge was a stone fireplace, the colour scheme on the walls was maroon and gold and the ceiling had a champagne tone. A wilton carpet was fitted throughout. The gantry was of veneer oak with mirrors to make the lounge appear even bigger. Tables and chairs were of birch with a natural wax finish. The chairs had red and white diced upholstery, wall seating in the lounge was upholstered in moquette and hide, red in the lounge and blue gray in the bar. The main bar was also refurbished, a feature in the bar was a tiled fireplace with built in coal scuttles, each scuttle held a cwt of coal. Local builders Rielly and Lang from Duke Street were responsible for the construction work. The pub was again extended in 1964 to cope with the increasing demand. The new pub consisted of two lounges a public bar and an off-sales department. Architect T M Miller succeeded in providing the decor and reconstruction of the premises. Interior view of the newly constructed smallest of the two lounges. 1964. The larger of the lounges. 1964. Here are some principal personalities who attended the smoker dinner held at Belmont House, Glasgow, by the Cowcaddens Ward of the Glasgow Association in 1962. Left to right: Mr G Ramster, Glasgow Association Office; Mr H Doherty, Symposium Bar, Cowcaddens Street; Mr N Jones, Cross Keys, St. Peter's Street; Mr J Dougan, Dougan's Bar, Springburn Road; Mr R Lemon, Lemon Tree, Parliamentary Road (Ward Convener); Mr W J Bennet, Port Dundas Road; Mr W B Gow, Bristol Bar, Cowcaddens; Mr J Lanagan, Maitland Street; Mr T F Flynn who succeeded Mr Gow as president of the Glasgow Association; Mr D McNiven, Argyle Arms, Kennedy Street; and Mr W J McDowall, Secretary, Glasgow Association. I passed the pub a few months ago and noticed the name above the door is now the Garngad Bar. 2007. Pictured at the recent Glasgow Vintners function in the Bellahouston Hotel are (above) Mr. & Mrs. H. Dougan, the Glen Bar: Mrs. & Mr. J. Deery, The Inn, Lambhill; Mrs. M. Byrne, The New Hawthorn; and Mr. W. Lochhead, United Rum Merchants.